Things are beginning to look up for MK Lightning. Since the departure of head coach Doug McKay, they have ended their record-breaking losing streak and despite losing to Nottingham Panthers on Saturday, Lightning stunned champions Cardiff Devils with a thrilling over-time win in Wales on Sunday. 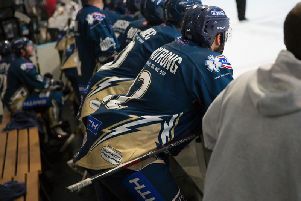 Lightning twice came from a goal behind to force the extra five minutes period before Georgs Golovkovs secured both points from Clay Anderson’s supply 3mins 44secs into the additional session – no Devils player picking him up as he skated in to beat goalie Ben Bowns. It was a rocket shot from man of the match Golovkovs on 59mins exactly that sent the encounter into overtime – the provider Andreas Valdix after Lightning had withdrawn goalie Patrick Killeen in favour of the extra skater. The result went a long way to making up for the disappointment of the previous night’s 3-1 loss to Nottingham Panthers at Planet Ice – the visitors’ last goal on an empty net giving a slightly flattering result to the game. Lightning’s win on Sunday was Devils’ fifth home league and cup loss of the season and consigned to history the 9-1 humbling Lightning suffered on their last visit to south Wales in September. Lightning survived a cross-checking penalty on Nelson Armstrong but couldn’t prevent Devils from going ahead on 14mins 41secs when new signing Drew Schiestel set up Charles Linglet to score. The hosts’ Evan Mosey was sin binned for cross checking early in the second session but Lightning could not make it pay and it looked as though they had slipped two goals in arrears when Joey Haddad had the puck in the net. Officials Matt Thompson and Matt Rose rightly spotted that Killeen had been impeded by Justin Faryna and washed the ‘goal’ out. 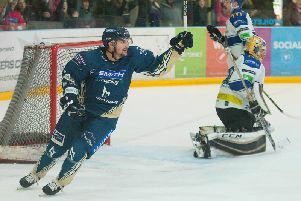 Golovkovs, whose puck control and skating skills seem to have been unlocked by new coaches Lannon and Wallace, forced Bowns into a fine save moments after MK had seen off a tripping penalty on Armstrong. Lightning eventually squared things up on the powerplay 1min 36secs into the third period – Gleason Fournier was in the sin bin when Anderson sent Robbie Baillargeon away for a wrap-around strike past Bowns. But Cardiff regained the advantage on a powerplay resulting from a hooking infraction by Rihards Grigors –Haddad getting off the mark at 45mins 39secs. As the clock counted down Killeen was taken off to allow MK to have six skaters and for once it paid off with Golovkovs’ equalising goal to secure overtime and the same players’ winner. Nottingham Panthers’ strength in depth eventually proved too much for Smith Recycling Milton Keynes Lightning when they came away from Planet Ice with a 3-1 win on Saturday. But Lightning didn’t give up without a fight and it was not until Killeen was for the extra skater following a timeout with 2mins 17secs remaining that Panthers were able to seal the victory with an empty net goal from Marek Tvrdon at 58mins 19secs. From the first face off Lightning showed their opponents no respect and for the early part of the first period they were the team producing the best chances. They were soon rewarded with the opening goal after 3mins 57secs - a great cross ice pass from Baillargeon being met by Radek Meidl on the back post. Panthers levelled the tallies after 9mins 12secs when Dylan Olsen’s blue liner was tipped in by Alex Guptil – the deflection giving Killeen no chance. It was a boarding penalty on Armstrong that gave Panthers the opportunity to go into the first interval a goal to the good - Robert Farmer shooting to the far side of the MK stopper with six seconds to the period buzzer. Just after the half way mark there was a powerplay chance for the home side as Panthers were caught with too many men following penalties on Rihards Grigors and Farmer for a late hit and roughing respectively. But they were unable to make it count. Into the third period Lightning were threatened with a one on one break by Alex Bolduc while team-mate Tvrdon was serving time for slashing – again Killeen blocked. As the game went into the final stages Golovkovs was forced to go solo when he had to no one to pass to – his blast being saved. With 2mins 17secs remaining Lightning made a decisive timeout call as a face off was signalled in the opposition’s defensive zone. Killeen was withdrawn immediately and after Tim Wallace’s effort from the blue line was stopped Tvrdon won possession on the right and found space to score on the empty net at 58mins 19secs to secure the points for the visitors. There was, however, time for a little last minute entertainment when Martin Mazanec and Tyler Biggs dropped the gloves for an indecisive bout, neither victorious but fighting penalties were dished out to both.